Size: Up to 12" (30cm), but usually smaller in aquaria - about 6-8" (15-20cm). Tank setup: Large tank (see comments) with plenty of hiding places and soft/smooth substrate. Water chemistry: Fairly soft, slightly acidic (pH 6-7) preferred, but will adapt to harder and more alkaline water. Feeding: Omnivorous, but prefers meaty foods. Provide a varied diet based on flake, granular and pellet foods, supplemented with frozen/live foods. Sexing: Unknown, females may be fuller bodied. Breeding: There have only been occasional spawnings reported in aquaria, of which there are no detailed accounts. 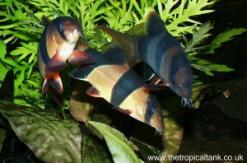 The Clown loach is now bred commercially on fish farms in large numbers. Comments: A very popular aquarium fish, both for its colour and its antics. One of its habits is to lie on its side when resting - which may alarm those not familiar with it, as the fish may appear to be ill! They may also make audible clicking sounds, particularly at feeding time. They tend to be more active if kept as a small group, rather than singly or in pairs. 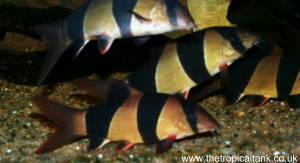 Clown loaches are sold in large numbers as juvenile fish, but grow larger than many inexperienced fishkeepers may realise. Although relatively slow-growing, juveniles should not really be raised in tanks much smaller than 4ft (122cm) long, and adults will require larger tanks. This can be a very long-lived fish - so consider before purchase whether a large tank can be provided for a fish that should certainly live longer than 10 years, with reports of 20 years plus not unusual. Provide plenty of refuges in the way of bogwood or hollow cylinders such as bamboo or pipes, as the fish like to rest out of sight. This fish is particularly prone to whitespot/ich when stressed in any way, so observe fish carefully before buying and ideally quarantine for at least 2 weeks before introducing to the main tank.